If you enjoy snacks with a bit of a kick, you will love these! 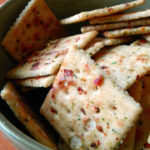 After following this simple recipe, you will have yourself some flavor packed crackers. Add all four ingredients to a large mixing bowl. Using a spatula or large spoon, gently mix ingredients for approximately 5-10 minutes to ensure that all ingredients are evenly coated. Spread crackers out on a large cookie sheet and bake in oven for 15-20 minutes, stirring them half way through. Gently mix the ingredients in a large bowl. You don’t want the crackers to break into a bunch of smaller pieces. A smaller bowl may make the mixing process more difficult. Want to soften the kick? They taste great dipped in sour cream!